HAPPY EASTER EVERYONE! In honour of this holiday we are going on a Easter egg hunting trip together! Doesn't that sound like fun? But be warned, this article contains lots of spoilers for the Fantastic Beasts movie! In honour of Easter we are going on a little Easter egg hunting trip together! Doesn’t that sound like fun? But be warned, there are many spoilers on the path ahead of us, so if you have not seen the “Fantastic Beasts and Where to Find Them” movie, stop reading right now, sit down with a warm cup of tea, some chocolate and watch the movie! All the others I wish a lot of fun, let me know if you already knew all of them or if you learned something new today! Let’s dive right into it the fantastic world, shall we? The first Easter egg you cannot look for, but only listen to and I am sure that most of you have noticed it! The moment the movie starts you are able to hear Hedwig’s theme, which then changes into the Fantastic Beasts theme. I am sure I wasn’t the only who got chills from all the feelings that suddenly overwhelmed me when hearing that familiar tune. Good times! This isn’t the only time though were we are able to hear a familiar soundtrack, many of the original pieces from Harry Potter were remixed and reused in several scenes within the movie – probably enough to fill a whole other Blog with it! But onto the next one! It will come shortly after, but be careful, if you blink you may miss it! 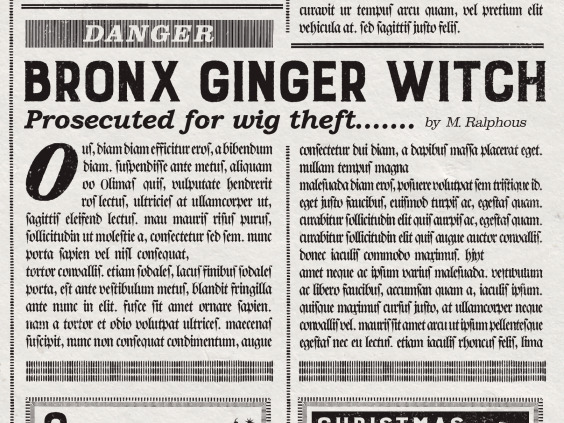 The Ginger Witch struck again as you will be able to read in the newspaper. This time she stole a wig! You haven’t heard of the Ginger Witch? Don’t worry, many haven’t even though this isn’t the first time she appears…well, technically as this movie is the earliest in the time line, it is, but ever since the third Harry Potter movie, you were able to follow her mischiefs in the Daily Prophet and the Quibbler, once she was a hooligan at a Muggle football match, another time she was involved in an in incident that involved two flying pigs. Try to look out for the Ginger Witch next time you watch a movie set in the Potter universe, I am sure you will be able to find out what else she did! The movie sure does not hold back with its Easter Eggs in the first few minutes. Just a little bit later we can see the inside of Newts case, when he presents it to a custom officer. I think everyone of you recognized the yellow and greyish-black colour of Newts scarf. He sure is a Hufflepuff and is proud of it, even though he was thrown out of Hogwarts! The next Easter egg, again will take place just a moment later, and maybe some of you – especially the Quidditch players – noticed it. Newt is standing in front of the Bank, listening to Mary Lou Barebones words, when suddenly she addresses him directly when she says “Are you a seeker? A seeker after truth?” poor Newt is a bit overwhelmed with the whole situation (as it seems to be the case, all throughout the movie, to be honest) and answers with the first thing that comes to his mind “I’m more of a Chaser, really.” Of course by that he means the Quidditch position. For the next Easter egg we have to follow Newt and Jacob into Newts suitcase. Take a look around and adore all the wonderful creatures in there! Have you seen some that are familiar? What about the Grindylow in a water bubble. The creature that attacked Fleur Delacour as well as Harry Potter during the second task of the Triwizard Tournament. But you have to pay attention to spot the creature, as it can only be seen for a mere two seconds! The next Easter egg we are looking at can be found during a conversation between Newt and Jacob, where Newt tells him that he worked with an Ukrainian Ironbelly dragon during World War I. Does that dragon ring a bell? Exactly! It is the same species that later guards the Lestrange Vault at Gringotts. And lastly I have some more things for you, which are rather (fast) facts than Easter Eggs, but they are quite interesting nonetheless. Did you know that the movie takes place in 1926? The birth year of Tom Marvolo Riddle. Or that there is a student at Hogwarts that is a relative to Queenie and Porpentina Goldstein? Anthony Goldstein, was a Ravenclaw student (and Prefect) and part of Dumbledores Army, I am sure Queenie and Tina are very proud of him. I am sure you all remember the Erumpment, but did you notice that in “the Deathly Hallows” Xenophilius Lovegood had an Erumpment horn in his house? It didn’t quite look the same, but the connection in there! And that isn’t the only connection to the Harry Potter movies, have you noticed Newt Scamanders footsteps on the Marauder’s Map in the Prisoner of Azkaban? A fact that is quite intriguing to say the least is that this isn’t the first time that Depp and Ferrell play two parts of the same character. It happened before in “The Imaginarium of Doctor Parnassus”. Maybe we will see more of the duo in the future, who knows? I have saved the (in my opinion) best fact for last! You would notice if an important character dies, wouldn’t you? Well, did you know that Credence sister died? Not Modesty, the youngest, but Chastity Barebone, the middle one. It is written in the script. We don't even see anything of her death in the movie, as if she wasn't important enough to mention that her oh so young life has come to an end. Wow...I didn't intend the ending of this article to be so sad…well I hope you enjoyed our little hunting trip anyway and let me know if I am the only one who now feels like rewatching the movie! Not that I didn’t watch it twice already just for this article…but I just can’t get enough of Queenie, Jacob, Newt, Tina and all the fantastic beasts! Hannah Kelles I found 2 of them! Skylar Smith great article. Happy easter! I might go re watch the movie now. Kendra Ainsley Great article, Mira dear. I love it! Lexie Clearwater amazing Mira. I love easter eggs!